A constellation is a group of stars in the sky that have been chosen to draw a picture. Constellations are used to find our way in the sky and have been used in the past per the sailors to know where to go. There are 88 constellations in the sky, and 12 are crossed per the Sun all along the year. They are the zodiac constellations. Among the constellations, the most famous per the astronoms are Ursa Mayor and Ursa Minor, better know under the names ''the great bear'' and ''the litle bear'', called also the great and the litle casserolle. 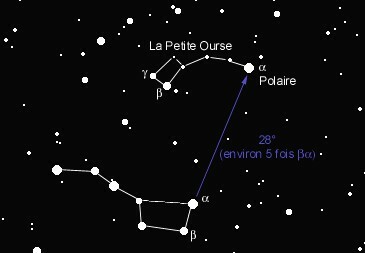 The litle bear is also very important because the star that is located at the end of the queue of it is the Polar Star, that gives the position of the North. In the Austral sky, the most famous constellation is the South Cross.